Are you looking for the perfect Father’s Day gift, birthday gift, holiday gift or get-well gift for Dad? Look no further. He’ll absolutely love this collection of 135 hilarious jokes, riddles and puns. Other Dad joke books are proud of how bad they are. We’re proud of how good our jokes are. Your whole family will love them!! Haven’t heard a Dad joke in a while? Want to share some more laughs with your family? Look no further than Ralph Lane’s ‘Dad Jokes Gift Book’! And to kick-off this new release, Ralph has kindly set aside a few minutes to go over his book, with a giggle or two. Ralph, there’s so many Dad Joke books out there, what inspired you to write your own? The Dad Jokes Gift Book started after a lifetime of enjoying and sharing dad jokes with friends, family and colleagues. I noticed that each joke was met with a loud groan and a huge smile. That was when I decided it was time to collect all the very best dad jokes and put them in an illustrated joke book. The idea of an illustrated joke book is great, but I’m curious to find out why you wrote a ‘gift book’? Those of us who are avid readers love to find, buy and read new books. But I have found that books also make the very best gifts. It is possible to find the perfect gift book for any person on your list. Even those who may say they don’t like reading will still enjoy a joke book or a picture book or a motivational book. I hope my books play a special part in many people’s birthdays, holidays and other special occasions. How did you want to make these events special and important? I wanted to make people laugh and to provide a great gift for Father’s Day, birthdays, Christmas and even Halloween. I knew that a Dad Jokes Gift Book would make the ideal gift, stocking stuffer or gift basket stuffer. What ideas and jokes did you pepper in from your own life to make sure it was a great stocking stuffer? I drew on a lifetime of enjoying and sharing dad jokes. I grew up listening to dad jokes then ended up being the king of dad jokes. Even as the self-proclaimed king of dad jokes, I’m sure you found you understand humour level elevated once you sat down and put your mind to work compiling the best jokes. What was the biggest learning experience from writing the book? I soon discovered that joke books need illustrations. I noticed that the majority of joke books and nearly all of the dad joke books were not illustrated. Adding illustrations provided that final touch of magic that made the Dad Jokes Gift Book rise to a whole new level above the other joke books. Illustrating is lots of fun, and so is writing, but sometimes writing can get a bit overwhelming. Did you ever find yourself exhausted by the thought of what needed to be done, or were you continuously energised to keep going? Writing is both energizing and exhausting. Planning a new book always energizes me. The ideas flow like electricity through a high voltage line. After a couple hours of writing, I start feeling a bit exhausted, so I take a break until I can start the process over again with a fresh outlook. What’s at the top of your mind when you have a fresh outlook on your work? No matter what type of book I am writing, I always think of how it will be received by children and young adults. After all, we were all young once; I hope my books bring out the youngster in all of us. Sometimes adults lose the ability to let go and enjoy a good belly laugh. I hope my joke books provide an opportunity for them to relearn that valuable skill. Regular belly laughs really should be put into law! Now, it sounds like you’re out there writing many books and learning many valuable writing skills. How do you feel that your author voice has progressed with each new writing project? I have learned to trust my author voice and allow it to come out naturally in all my writing. We all have that inner voice just waiting to escape and run free. The more I write, the more confident I am in allowing my inner voice to romp freely through the landscape of my imagination. What has been your personal favourite example of that inner voice escaping in ‘Dad Jokes Gift Book’? “What’s the difference between ignorance and apathy? I don’t know and I don’t care. *Laughs* Accurate and amusing. Perhaps there are no cares between ignorance and apathy, but I’m sure you care about your author brand. What steps have you taken so far to create branding to tie your work together? Discovering and creating an author brand is an ongoing process. I started by just writing fiction books. Recently I have discovered that I am also filled with holiday books, nonfiction books, joke books and even a biography or two. My biggest fans no longer expect me to stick to any specific genre or even a rigid brand. My author brand changes slightly with each book I publish. I like an author who is up to the challenge of writing in all of the genres! What genres are you next and current projects in? After reading my favorite Halloween book “The Legend of Decimus Croome: A Halloween Carol,” I decided I’m going to publish a Halloween jokes book. There are so many hilarious scenes in “A Halloween Carol,” and it made me realize that Halloween has both a spooky side and funny side. I haven’t really considered the funny side of Halloween much before, but I think I’ll have to check out your inspiring book and see if I can find some giggles! As I know you love a good belly laugh I think it’s time for today’s interview to change gears, while we move onto our quirky quick-fire question round. Let’s try and get our bellies laughing straight off with the answer to the question if money doesn’t grow on trees then why do banks have branches? See? Now that’s a great Dad joke. They’re everywhere. If we ever decide on a national joke, I hope it’s the Dad joke. Who doesn’t love a good Dad Joke? I think it’s fair to admit that most of the quickfire questions have about the same level of humor as Dad jokes at times. But I’ve had some absolutely fantastic answers that have made me laugh so hard that I can’t resist. And as someone who has written a Dad joke book, you have the same affliction, so you should be able to give a great answer to my next question if space is a vacuum, who changes the bags? You always have to be careful about the location of the dirtbag – you want to make sure that something like newspaper is laid down to prevent the dirt going everywhere. Okay next, why is a square meal served on round plates? For the same reason, we drive on parkways and park in driveways. *Laughs* Oh, the quirks of the English language. I’m looking at my next question and it’s not a fun one, but I’ll ask it anyway. Have you ever been on a literary pilgrimage? I recently spent a day at Dylan Thomas’ house in Swansea, Wales. On the same trip, I spent a full week biking in and around Stratford-Upon-Avon in England. Oh sure, William Shakespeare was no Ralph Lane, but he was a fairly decent writer. Yeah, I hear that one of two of the things he wrote are popular. But you’re right, he is no Ralph Lane! *Laughs* So, as a writer who’s better than Shakespeare, you must have a favourite word. What is it? Smiles is both my favorite and longest word. There is a mile between the first and last letter. *Smiles* I didn’t notice that before, but with logic like that it’s going to become one of my favourite words too! Here’s a question that you might like, what happens if Batman gets bitten by a vampire? Everyone knows that Batman is a fictional character. However, if Superman got bitten by a vampire, he would turn into Batman who would no longer be fictional. That might be some mighty fine poison in the vampire’s fangs to get a result like that! Time to get creative now, if you could breed two animals together to create the most awesome animal ever, what would you do? I would breed a snowman with a vampire. I don’t know what kind of an animal it would be, but it would have the worst case of frostbite ever. Would it become a snowman that wears a cape and has fangs? I’m not sure, but I’m sure the frostbite would be a killer. I’m actually at the end of the quirky questions for today, but as you’re well versed in the same level of humor, what quirky question do you think I should add, and what answer would you give for it? Q: What kind of a sycophant are you? A: I don’t know; what kind of a sycophant would you like me to be? *Laughs* Those sycophants! Ralph, I’m going to have it leave it here today, but thanks for sharing a few laughs with me, and showing our readers where they can find more in ‘Dad Jokes Gift Book’. Excited to read the book we discussed today? Find it here on Amazon: ‘Dad Jokes Gift Book ( ASIN: B07CX4BJBT )‘. 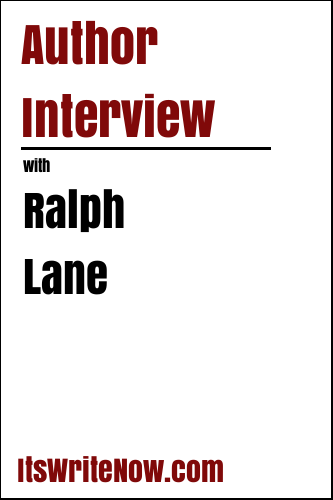 Want to find out more about Ralph Lane? Connect here!